Dersingham post mill stood to the northwest of the village adjacent to Lyng Row Farm. The mill buck had a gallery around the eaves and stood on a single storey, tiled roundhouse. The 4 double shuttered sails drove 2 pairs of French burr stones and a flour mill. The fantail was on the tail pole. A horse mill on the premises drove a further two flour mills. fituated in Darfingham, with two pair French ftones, flour mill, and going gears, and horfe mill, with two flour mills, fituated on more lefs than one acre of land, all in capital repair - a moft defirable . 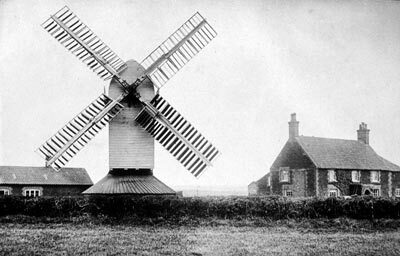 . .
A Capital Post WINDMILL & an Acre of Land situate in Dersingham in Norfolk, with two pair of French Stones, Flour Mill & going Gears & a Horse Mill with two Flour Mills. The premises are all in good repair & there is a valuable trade connected with them, the situation is desirable & well worthy of attention. Apply personally to Mr. William Hall of Gatesend. Mr. Wm. Smith senior, Dersingham, will shew the premises of which immediate possession may be had. A Capital Post WINDMILL with two pairs of French Stones & two flour Mills, a newly built Dwelling house & other necessary buildings, situate at Dersingham, near Lynn, Norfolk. Enquire of Mr. Silcock on the premises. All the FARMING STOCK, Implements, Household Furniture ... and other effects of Mr. G. Silcock of Dersingham Mill in the county of Norfolk under a Deed of Assignment for the Benefit of Creditors. 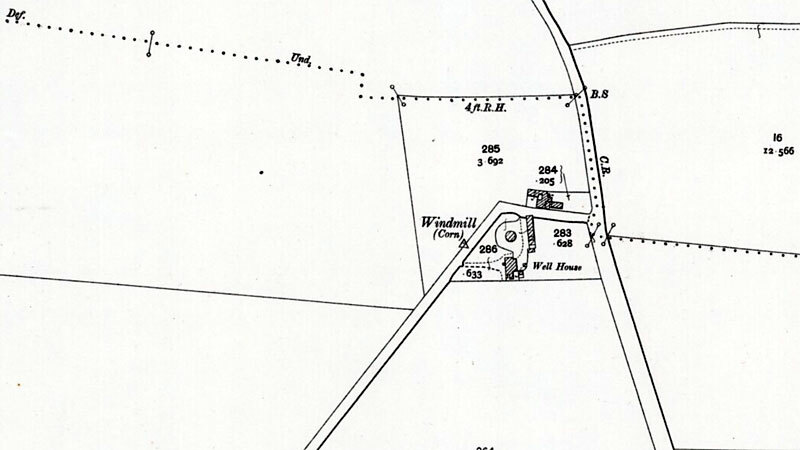 A Capital POST WINDMILL driving two pairs of French stones, with roundhouse under the same, a good dwelling house with barn, stable, piggeries & other outbuildings. Also six acres of excellent arable land lying contiguous thereto, situated in the parish of Dersingham In the county of Norfolk, within nine miles of the Port of Kings Lynn, in the midst of a good corn district. Possession of which may be had at Lady day next or sooner if requested. Enquire of Mr. R. Stanton (by Church) or Mr. W. Sturley, Auctioneer, both of Dersingham, if by letter post paid. Lot 3. A Good Dwelling house with Corn Windmill, Barn, Stables, Granary, Piggeries & other convenient outbuildings in good repair, Yards, Garden & seven acres (more or less) of excellent Land now in the occupation of Mr. R. Sherwood. This Lot is Freehold. Possession may be had on the 11 th October next if required. Apply to Messrs. Jarvis, Attornies, Lynn. Map by Newton & Woodrow, Norwich. son of James Fitt Miller. On the 28th ult., Mr. James Fitt, Miller, Dersingham, aged 77 years; and on Febraury the 6th, Mary wife of the above aged 71 years. WANTED immediately, a Man that understands his Business as a MILLER & BAKER. Apply by letter or personally to Matthew Fitt, Dersingham near Lynn. In the occupation of Mr. Matthew Fitt, will be Sold by Auction in the month of May, unless previously disposed of by private contract. Application to Mr. Jarvis or Messrs. Partridge & Edwards, Lynn. March 26 1866. The Mill, House & about 6 acres of land at Dersingham in the occupation of Mr. Matthew Fitt will be Sold by Auction in May. Apply to Mr. Jarvis or Messrs. Partridge & Edwards, Solrs. Lynn. April 1866. To be Sold by Auction by Messrs. Cruso & Son at the Globe Hotel, Kings Lynn on Tuesday 3 July 1866 at 4 for 5 o’c. Either together or in lots. The following valuable FREEHOLD PROPERTY situate at Dersingham. All that WIND CORN MILL with the Dwelling house, Bakehouse, Outbuildings & the Yard & Garden & Land adjoining & belonging thereto, containing (including the site of the said Mill, House & Premises) 2 roods 15 perches, be the same more or less, lying next the Mill Road north & west, Ingoldisthorpe Glebe Land east & land belonging to Mrs. Rouses Trustees south. The whole of the above Property is now in the occupation of Mr. Matthew Fitt. Possession may be had at Michaelmas next. Wanted a steady man who thoroughly understands his business. Good references required. Apply to Mr. Fitt, Dersingham. Wanted a thorough good man, one who has been accustomed to a country trade. Liberal wages, with cottage. 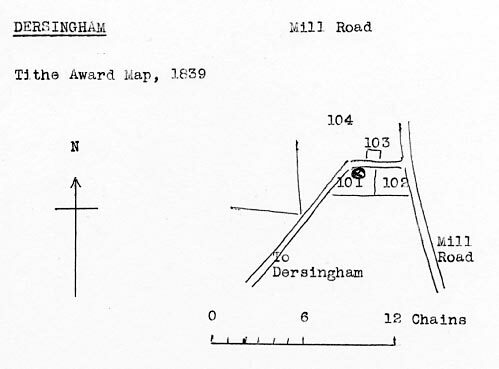 Apply to Mr. W. Fitt, Dersingham, Norfolk. Wanted, a man who well understands his business as Miller etc. Apply to Mr. M. Fitt, Miller etc. Dersingham, Norfolk. WANTED at once a good Miller & Baker; one who understands driving cart. Apply to M. Fitt, Dersingham Mill. Lot 1. A WIND CORN-MILL with a good roomy Dwelling House, Bake House, Stable, Cow House, Yard, Garden & Land adjoining & a newly erected & well built four roomed COTTAGE thereon, including a piece of very fine ARABLE LAND called “The Mill Close”, containing altogether 4a.1r.31p. or thereabouts, situated on the hill at Dersingham, lately in the occupation of Mr. Matthew Fitt deceased & his under-tenant. The Windmill, which stands on a hill & drives two pairs of French stones, is in good going order & in good repair. And there is a good baking business connected with the Property. There is a wall of excellent water on this lot. Lot 2. 3a.1r.25p. FREEHOLD ARABLE LAND … also lately in the occupation of Mr. Fitt. The wheat straw which will be on Lot 2 at the time fixed for completion of the purchase will have to be taken by the purchaser of that lot at a valuation price to be ascertained in the usual way. For further particulars & to view the property apply to Mr. Matthew James Fitt on the premises or to Partridge & Co. Solrs. Kings Lynn. Are favoured with instructions from the representitives of the late Mr. Matthew Fitt to Sell by Auction on Thursday July 10, 1890 the Household Furniture & Effects, the contents of the above house. Sale to commence at 11 o'c prompt. on instructions from Executors of the late Matthew Fitt. Miller & Baker wanted, a single young man with good reference. FITT'S MILL. An interesting landmark, for many years known as "Fitt's mill," has disappeared during the past few weeks. Standing on top of the hill to the north of the village, it commanded a wider stretch of sea and country than even the famous Snettisham spire. About 200 years old, it was owned for many years by the late Mr. Matthew Fitt, a well known farmer, miller and baker; who brought up a very large family under it's sheltering wings. Mr. Herbert Playford recently sold the property to take up his residence in the business part of the village. Remains of roundhouse, sunk several steps down from top of a slight mound. Inside now a goldfish pond. Several courses of brick above ground together with 4 piers a little higher. Also in flowerbed - a peak millstone with right hand furrows.